Now I must admit, Padholdr had a clever booth at CES. Their cardboard booth caught the eyes of many during the week long event in Las Vegas. However when we perused their tablet stand offerings it was like every other tablet stand manufacturer out there. They did have a few clever ideas but nothing like the tablet stand that arrived at our office the day we got back from CES. The Flote stand looked like it was ripped out of a contemporary penthouse in Central Park West. Aesthetically it’s a beautiful, almost art worthy piece, functionally it’s just as good. The Flote m2 floor stand is anchored by a floor weight that makes it easy to move the tablet in any direction, and any angle you could possibly need. The magnetic holder that holds the tablet in place could survive a big fall (and it has in our office). The Flote m2 floor stand is designed to function in a variety of ways. Podium- The Flote m2 floor stand can be used straight up and on the middle of a stage either to read from or conduct an orchestra. The grip on the tablet is firm and not clunky and the weight in the stand itself is counter balanced in a way that makes it fluid and adjustable whether your 5’5 or 6’9. 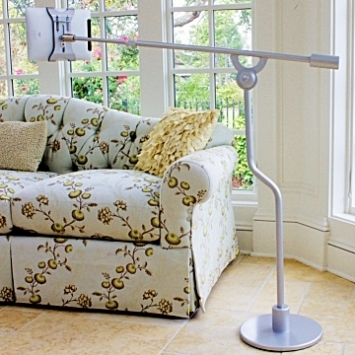 Boom stand- The Flote m2 can be placed next to an end table or lamp in the living room. 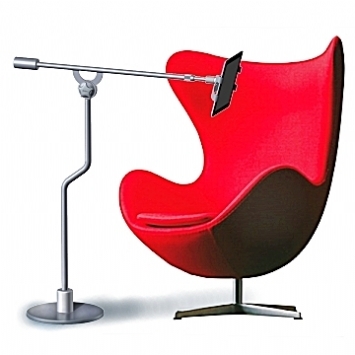 The adjustable boom arm can be angled over a chair, a love seat or your end of the couch. Don’t worry bumping it won’t totally knock the stand out of wack. In fact our boxer ran into the Flote m2 and probably hurt his head, while the tablet stayed exactly where we wanted it. Over the bed- The Flote m2 can be positioned over the bed so that you can either work at an angle or watch a movie at a favorable height. The best part is that the tablet is held firmly in place so if you fall asleep you’re not going to break your nose. Just as it does when it’s over a chair or couch, the Flote will stay in place if you roll around in bed or get out of bed to fetch some hot cocoa. But the best part about the floor stand, and the desktop stand as well, is the fact that it’s well designed. It’s the kind of stand you’d expect at Crate and Barrel, not at Target. That’s what designer David Cutler was going for when he designed the Flote. The Flote line of tablet stands can be used for personal or commercial purposes. The Flote m2 floor stand will rival any of the latest tablet kiosks available on the market for hundreds of dollars more than what you’ll pay for a Flote. Whether you’re using the Flote tablet stand to greet customers at your receptionist station, or you’re using it to practice music, the uses for this stand are endless and the workmanship in the product means that you’ll be able to use the same Flote tablet stand for many years and many uses.